Christy Nichols was an undergraduate major in biology, minoring in French, when she composed parts of this blog piece on the local language of Alsace-Lorraine, a region of France, in spring 2012 in the European Union Center’s ‘Language and Minorities in Europe (418)’course. Jessica Nicholas is a PhD Candidate in the Department of French, specializing in French Linguistics. She has a particular interest in language ideologies, variation, and education. She is one of the associate editors of the EUC blog site Linguis Europae, and shaped Christy’s blog entry into its current form. It is good to note here that the ancient history of the region has long witnessed cultural blending. The simultaneous presence of the Romans and Germanic tribes was attested in the area until the departure of the Romans in the 5th century. In 870, Alsace became a German possession. During the 17th and 18th centuries, France annexed Strasbourg, the regional capital, and the territories of Lorraine and the Moselle. 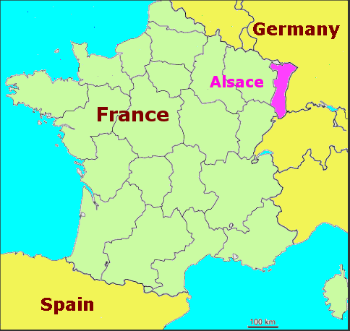 Most of Alsace, including schools, was administratively French but culturally German until 1859. After the Franco-Prussian War in 1871, Alsace became German once again. Until the end of the First World War in 1918, Alsace-Lorraine was part of the German Empire. In 1940, Nazi Germany annexed it for the Third Reich, and the territory did not return to France until the Liberation in 1945. The end of the war in 1945 marked the low point in Franco-German relations, and the French government forbade the use of the German language in schools. 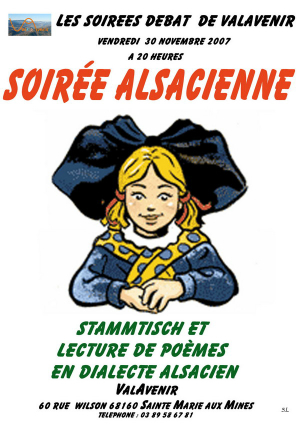 It would be another twenty years before the first sign of recognition of the regional local culture in Alsace. Although the Loi Deixonne, in 1951, opened the path to the teaching of Breton, Basque, Occitan and Catalan in France, Germanic speech did not receive the same recognition as the other regional languages right away after the war. It wasn’t until 1985 that France recognized this dialect of German as one of its regional languages, strongly supported by a new generation of Alsatians who have a much more positive attitude towards their Franco-Germanic regional identity than that of their parents’ generation. At the beginning of the 1990s, Alsatian primary schools were authorized to begin French-German bilingual instruction. Schools normally are French-medium schools in Alsace. Parents who want their children to be schooled in a bilingual program have to demonstrate to the local education authorities that there is a large enough group of families willing to switch to bilingual education. An additional complication comes from the fact that the local language is not a standardized language with a set orthography and grammar books with rules that can be taught to schoolchildren. Instruction in German- when it is offered- is in High German, and thus in the prestige variety of German that is spoken and written throughout German-speaking Europe. 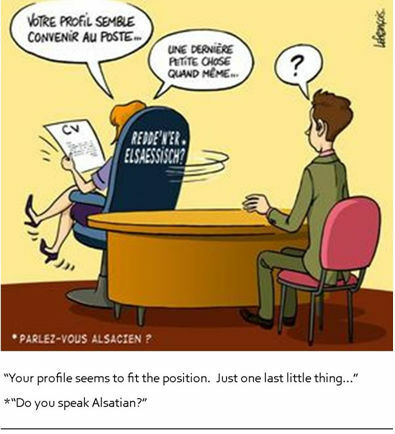 It is therefore unsurprising that, since the introduction of bilingual schools, those teachers recruited locally in Alsace do not always know how to speak High German, which causes problems in the profession. Amid all these changes, Alsatians have always continued to speak Alsatian outside schools and formal contexts. Nonetheless, the forced francization after the wars triggered a decline of the Alsatian language. There are regionalist movements that have taken as their mission the protection of the local language. Among these, the regionalist movement “l’Alsace d’abord” (“Alsace First”) is a political party which seeks political and economic autonomy. The partisans in this party support the idea of a bilingual region, with French and Alsatian as official languages. Although Alsace is an extremely important territory for the European Union, and in spite of the fact that the Alsatian language constitutes a direct link between the two founding countries of the Union, the Alsatian language has no official status in Alsace-Lorraine. The French government signed the European Charter of Regional or Minority Languages in 1992, but has not yet ratified it. Despite the addition of a special clause to the Constitution in 2008, recognizing regional languages as being part of the heritage of the Republic, the language of the Republic remains French, forbidding the division of the people. Without changing the Constitution (or its interpretation), it is unlikely that France will ratify this Charter anytime soon. Parliament recently voted for ratification, but it did not succeed in gaining the required number of votes. So what, then, is the future of Alsatian, the language spoken in the region? There is now an increased interest in the Alsatian language. The recognition of regional cultures as a treasure of the cultural heritage of France in the Constitution (loi constitutionnelle du 23 juillet 2008) has undoubtedly contributed to the increase in preservation of regional languages. 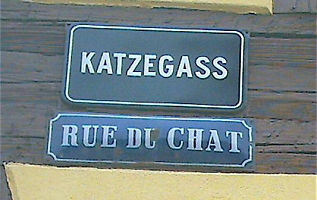 One can see more and more bilingual street signs in Strasbourg. Alsatian is now recognized as a language of France, and high school students can choose to study it. But all the advantages that Alsatian receives currently in Alsace can be set back by gaffes like that of Sarkozy, who affirmed himself to be in Germany during his trip to Alsace. Granted, it was an easy slip of the tongue since “Alsace” and “Allemagne” start with the same sounds, but the fact remains that the territory’s French identity is in question. This could push Alsatians to develop the necessity to prove their French identity, as they did after the war, and to abandon their regional language. In preserving Alsatian, on the contrary, they could choose to put more emphasis on their pride of being Alsatian, preserving the language as a vestige of local culture. We anticipate now the future of Alsatian in Alsace. Most people who speak the dialect are older, and the transmission of the language in the home has been in decline since the war. Alsatian is threatened on the German and French sides by two powerful languages that are spoken, written, and read in institutions of government and in the European Union. The linguistic policy of France and of the European Union in the next few decades will determine if Alsatian will survive in the few private domains that are still reserved for it.